Time Estate Winery’s decision to move into downtown Penticton is déjà vu all over again for Harry McWatters, the owner of Time. Now a legend in the BC wine industry, Harry (right) began his wine career in 1968 in sales for Casabello Wines, a winery established in 1966 on Main Street South in Penticton. It was a substantial establishment with a show vineyard in the front yard and a big tank farm in the back. After Casabello was acquired by Cartier Wines – later Vincor – the tanks and the wines were moved to the Jackson-Triggs winery at Oliver. Production ended in Penticton in March 1994. The winery was demolished by the end of the year, to be replaced by a shopping centre. The memory of Casabello has faded. Andrew Jakubeit, Penticton’s youthful mayor, had not heard of Casabello when Harry briefed him on the plan to transform Time into an urban winery a few blocks from Penticton’s Okanagan Lake beach. That is understandable. The mayor moved to Penticton about the same time as Casabello closed. Time is moving downtown from the Sundial Vineyard on Black Sage Road after the recent sale of that property to a Chinese businessman. 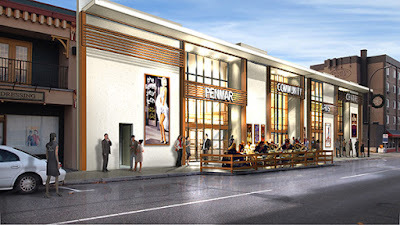 The new location is the Pen-Mar Cinema Centre at 361 Martin Street. Landmark Theatres stopped showing movies there in 2012, moving to a larger and more modern theatre nearby. The Pen-Mar was built in 1956. In another déjà vu moment, Harry recalls going to a Saturday afternoon matinee there that summer. He says he does not remember the movie but he does remember the girl who went with him. It is a 12,000-square-foot building on an acre of land. The future winery’s footprint is actually larger than the winery that Harry had started to build last year at the Sundial Vineyard. Ambitious plans are being made for the former theatre. Hospitality plans include a modest bistro along with a tasting room. The wine shop likely will remain open into the early evening. The early priority will be moving tanks and other winery equipment from Sundial to the former theatre. Additional tanks also are being ordered, to be in place for what looks like another early harvest in 2016. The wine shop might be open as early as Labour Day, although Harry admits that is optimistic. “We are exploring the possibility of have a temporary setup, at least to be able to sell some wine. Our goal would be to be open for Wine Festival” at the beginning of October. Moving downtown to a property without a vineyard means that Time will need to switch from a land-based license to a commercial licence. That has some impact on winery bookkeeping but the consumer will not see any difference.